When you visit Character Locator, you’ll find this menu, which is always located in the top left corner of the site. 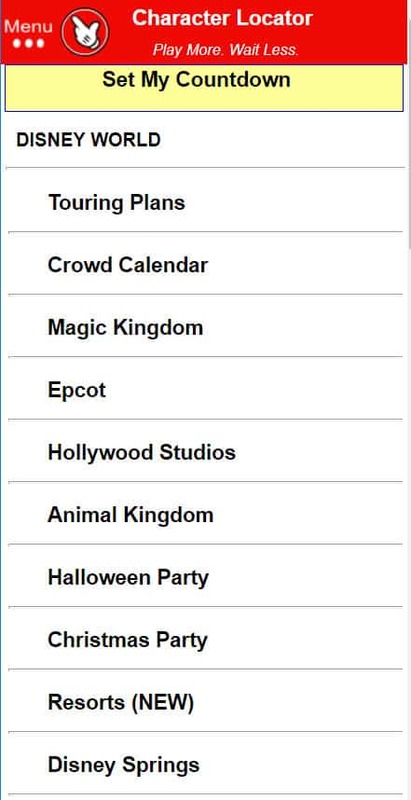 As you can see, you’ll find planning information for Disney World, Disneyland and Universal Orlando. There’s Touring Plans for each destination, a great Chat Room, and some fun trivia. 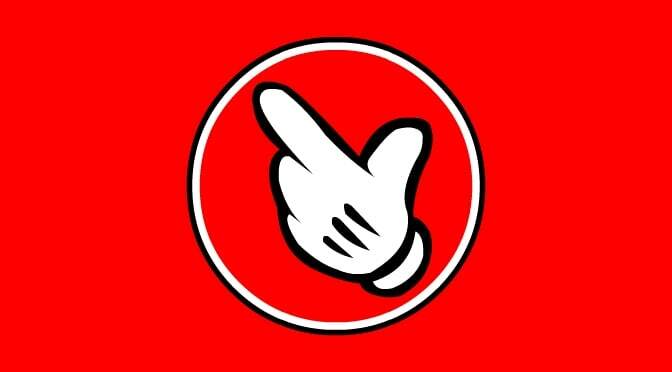 We will click on the Disney World tab. You’ll notice that there’s a ton of information here, so we will scroll down to the Resorts tab and click on that. Character Locator is terrific because it has the exact same, fast-loading, experience regardless of device! 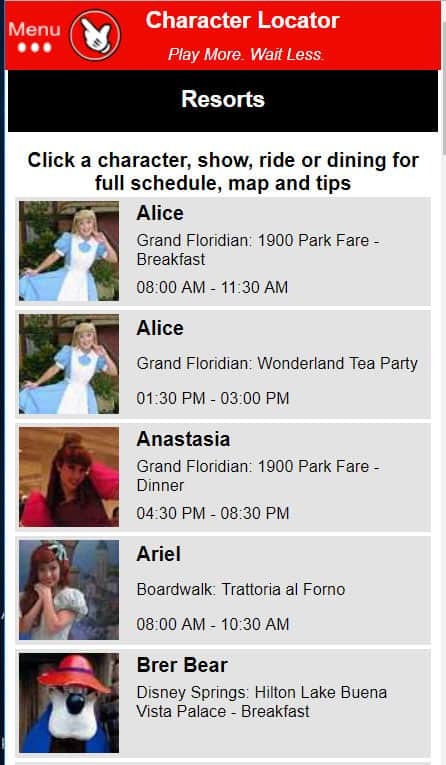 Once you click on that Resorts listing, it will take you to a full lineup of the characters you can expect to meet at the various resort Character Dining experiences. It provides subscribers with the name, a photo that I took, the location and the time(s) of the meal. Once you click on a character, you’ll find a few more details like other characters that may appear at that meal and interaction tips. Hey, just because you’re eating breakfast doesn’t mean you can’t have fun with characters! 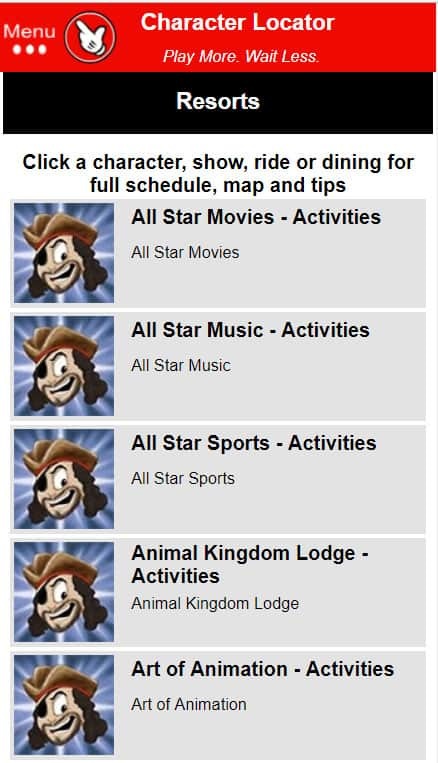 When you click on the ACTIVITIES tab at the bottom of the screen, you’ll see a full listing of the resorts and their activities. I’ll be detailing this out even more in the coming weeks, but you can find the pool activity schedules and more in this listing. The TOURS tab affords you with the information on various tours that are provided by the different resorts. That includes Fireworks cruises and children’s pirate tours. I’m still adding more details here, so you’ll see more information later. If you click on MENUS on the bottom tabs, you’ll find a complete listing of resort dining. At a glance you can find if it is a character meal, the time(s) of the meal and if it is Table, Counter or Cart service. You can also sort this at the bottom of the screen. 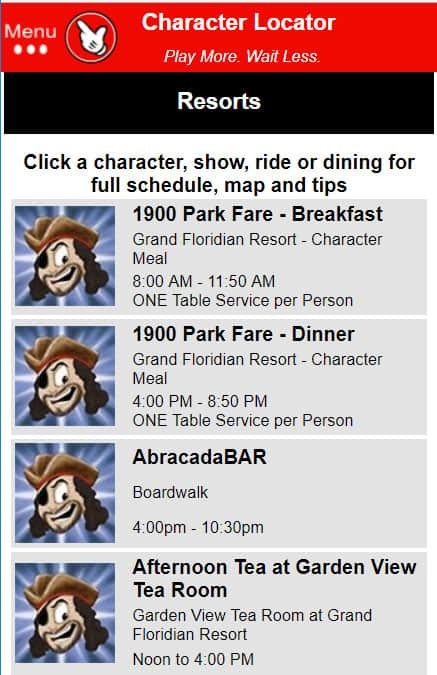 Once you click upon a meal, you’ll see full details (if it is a character meal, you’ll see those here). 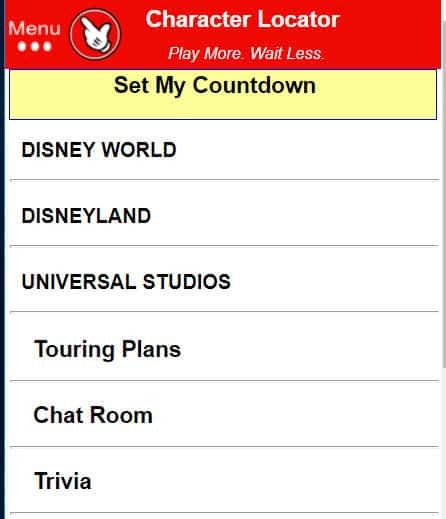 It tells you how many Disney Dining Plan Credits it will require, if there are discounts available, if the tip is included, if reservations are required and whether you need to pre-pay for the meal. I then provide a few details about the meal. You’ll find that the snacks which are eligible for the Disney Dining Plan snack credit are clearly marked for you when appropriate. We are constantly improving Character Locator. Subscribe today and get this information, as well as information for all of Disney World, Disneyland and Universal Orlando. One low price covers all THREE destinations! 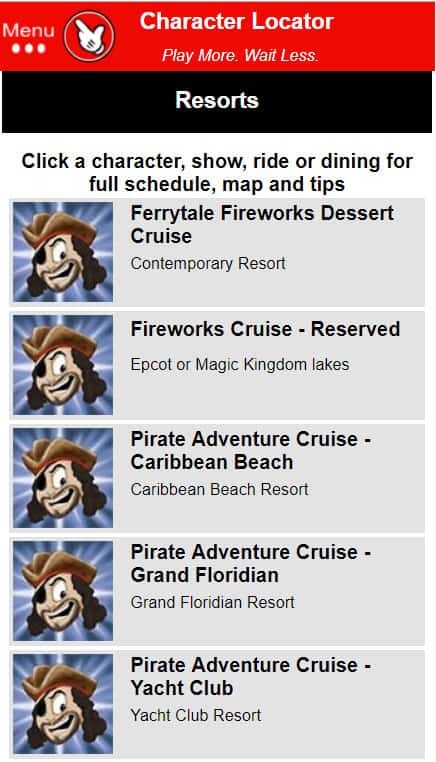 For less than the cost of a cheeseburger in the theme parks, you get full planning information. Previous PostSeptember 2018 Disney World park hours, Extra Magic Hours and Crowd Calendar releasedNext PostToy Story Land opening, ride heights and Extra Magic Hours added! That is awesome! Your website continues to be my favorite for planning.